It is such an amazing honor to be an Ambassador Family for the March of Dimes. Through this, I am able to share awareness of Twin to Twin Transfusion Syndrome and actively take part in an organization that has the know how and the influence to help us fight this terrible disease. This morning I spoke at the Kick Off for the Midlands Region “March for Babies.” I’d like to share with you the speech (more or less) that I gave. My world was rocked when my OB told me at 20 weeks that the twin girls I was carrying were dying from Twin to Twin Transfusion Syndrome. 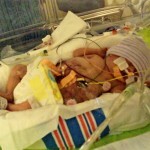 Miraculously, we made it another ten weeks before they were born at 30 weeks and 5 days. 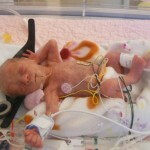 Two days after their birth, Kathryn passed away. But thankfully our other one was determined to stick around! I wanted to get out of that place so badly. I needed her home, in my arms. I wanted to stop seeing Room 2, space 302 every time I walked into the NICU. That is where I held my two day old infant for the last time and told her goodbye. I needed something to keep my mind occupied. I noticed the March for Babies posters on the wall. I had never participated in a March of Dimes event. I’m not even sure I knew what the March of Dimes did. I knew it had something to do with babies. I had no reason to know before now. Isn’t that the way life is? I began to learn about the March of Dimes and all of the amazing advances in medical practices, preventative health, prenatal care, and research that have not only had a major impact on reducing preterm births, but have significantly improved the outcomes and chances of survival of those babies born preterm. 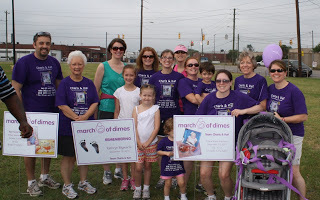 Once I understood the mission of the March of Dimes, I decided to start a team. I really had no idea how well this would be received, and I found myself nervous about asking friends and family to participate. I have done so many walks and fundraised for so many different organizations that I thought I might receive a lukewarm response. But I asked anyway. And I was uplifted and quite frankly blown away by the support that came flooding in. I had more than 20 walkers on our team, personally raised over $2500 and our team altogether raised just over $6600! It was amazing! There were some (large) corporate teams that didn’t even raise that much! Granted, that is small beans compared to some large teams, but I was ecstatic! The turnout, the support, and the joy that I felt from participating in this made me realize that this was certainly one way that I could physically do something to honor Kathryn, to spread more awareness, and to push for more advocacy specifically geared toward TTTS, which causes thousands of preterm births and infant mortality each year. This year is the 75th Anniversary of the March of Dimes! The mission began as a fight against polio (began by President FDR, who was left paralyzed by polio) and later shifted to fighting birth defects and infant mortality. 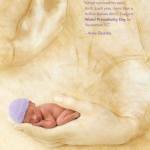 The Prematurity Campaign, an aggressive campaign to reduce the rising numbers of preterm babies, was launched in 2003. Because of the work and advocacy of the March of Dimes, we have newborn screening, better prenatal care, lung surfactant treatment, a reduction in birth defects, more money and advances in the neonatal intensive care units (NICUs) and more. 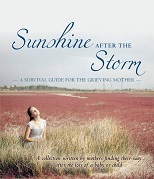 These advances saved one of my daughters. There is no doubt she, and many other babies fighting every day to survive, would not have lived without the victories the March of Dimes has achieved. My dream is that one day they will also know how to treat Twin to Twin Transfusion Syndrome, or at least know what to do to stabilize a baby suffering from hydrops fetalis, as Kathryn did. Through our continued support, donations, and advocacy, we will continue to see a drop in prematurity and a rise in technology and advances to help these tiny fighters. 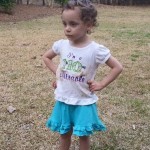 Every dollar raised, I see as hope that one day there will be a cure for TTTS, for hydrops. 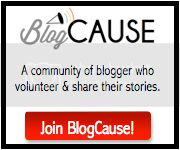 We can all be very successful fundraisers for this incredible organization. It just takes a connection… a story. We had a story. A very recent, very sad story. But you have a story too. We are all here today because we suffered through or know someone who suffered through a preterm birth, a period of fear and not knowing what would happen, and the awful NICU stay. Make this effort personal, share your journey and you will not only meet your goal, but exceed it! Thank you for your continued dedication and support to the March of Dimes and for the babies. As we kick off the season building up to the March for Babies, remember what it is we are fighting for. 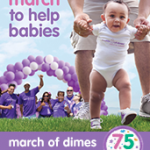 This year is the 75th Birthday of the March of Dimes. Let’s celebrate the achievements, let’s celebrate life! Let’s go raise money and save a “Kathryn!” We will be raising money until April 26th on our team page: Team Charis and Kat!